Glaucoma is a disease that damages the optic nerve and its progression could result in vision loss and blindness. Treatment of glaucoma starts with topical eye drops belonging to the class of prostaglandins, beta blockers, alpha agonist, combination medication, carbonic anhydrase inhibitor, and cholinergic. Administration of these eye drops reduces the production of the fluid inside eyes, thereby decreasing intraocular pressure. Topical eye drops is an alternative for surgery or to delay surgical procedure. The global glaucoma therapeutics market was valued at US$ 5,932.6 Mn in 2017 is anticipated to reach US$ 7,659.8 Mn by 2026, expanding at a CAGR of 2.9% from 2018 to 2026. 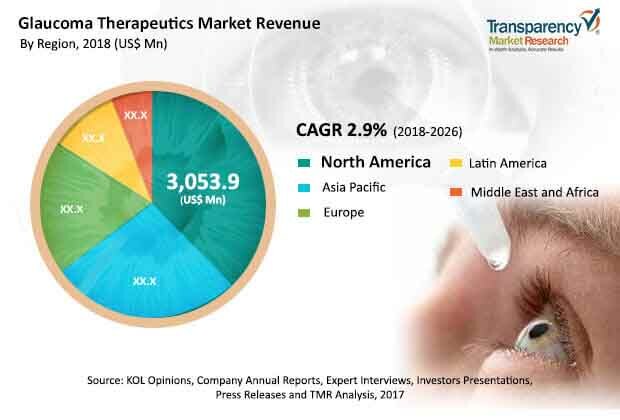 Increase in prevalence and incidence of diabetic disorders, rise in geriatric population, improved health care as well as health care infrastructure, introduction of combination therapies, and surge in the number of awareness programs are likely to drive the global glaucoma therapeutics market during the forecast period. Lack of awareness about eye disorders, non-compliance with treatment, side effects of glaucoma drugs, and growth of the generic drugs market are anticipated to restrain the global market in the near future. However, emerging economies such as India, China, Brazil, Russia, Mexico, and South Africa offer immense opportunities in the glaucoma therapeutics market. This is attributed to large number of underserved patients, rise in proportion of urban population, and insurance policies. Moreover, governments of the nations mentioned above have taken initiatives to educate the people about glaucoma and its management. The global glaucoma therapeutics market has been segmented based on drug class, end-user, and region. In terms of drug class, the global market has been classified into prostaglandins, beta blockers, alpha agonist, combination medication, and carbonic anhydrase inhibitors and cholinergic. Prostaglandins analogs are the molecules that bind to the prostaglandin receptor increasing the outflow of the fluid from the eyes and reducing intraocular pressure. Beta blockers are also commonly used topical drugs, which act by reducing the production of fluid inside the eyes. Combination medications are eye drops used in patients who require more than one medication. Cholinergic agents aid in the treatment of glaucoma by contracting the ciliary muscles, tightening the trabecular meshwork, and increasing the outflow of fluid. Carbonic anhydrase inhibitor and alpha agonist are used to increase the outflow of fluid from the eyes, thereby reducing intraocular pressure. Prostaglandins, beta blockers, and combination medication are the most widely used topical agents. The combination medication segment is projected to account for the largest share of the market during the forecast period, followed by beta blockers and prostaglandins. However, rise in prevalence of glaucoma globally has fueled the growth of the combination medication segment. The segment is expected to expand at a high CAGR during the forecast period. Rise in awareness about early detection of glaucoma and provision of affordable treatment options are expected to boost the growth of the combination medication segment during the forecast period. In terms of end-user, the hospitals segment captured major share of the global glaucoma therapeutics market in 2017. The segment is likely to sustain its leadership position during the forecast period. A large population prefers visiting hospitals first rather than specialty clinics for treatment, as the cost of therapy at hospitals is lower. Ambulatory surgical center is the less preferred option for the treatment of glaucoma. Geographically, the global glaucoma therapeutics market has been segmented into North America, Europe, Asia Pacific, Latin America, and Middle East & Africa. North America and Europe accounted for a combined market share of 50.2% in 2017. North America is projected to continue to dominate the market during the forecast period due to increase in the geriatric population, rise in awareness among the population about glaucoma, availability of reimbursements, and well-established health care infrastructure. The market in Asia Pacific is expected to expand at a high CAGR during the forecast period. However, the market in Latin America and Middle East & Africa is anticipated to witness sluggish growth during the forecast period. Increase in focus by federal governments on enhancing health care facilities and rise in awareness among the population are the factors contributing to the growth of the market in these regions. Major players operating in the global glaucoma therapeutics market are Allergan, Inc., Merck & Co., Pfizer, Inc., Novartis AG., Santen Pharmaceuticals, Valeant Pharmaceuticals, and Aerie Pharmaceuticals. Players in the generics market are Fera Pharmaceuticals, Teva Pharmaceuticals, and Aristo Pharmaceuticals, among others. The market is characterized by large number of acquisitions, which has led to market consolidation and increasing dominance of the top players.